After years of growing revenues and readership, alternative newsweeklies – free papers that have traditionally targeted younger readers with an emphasis on arts coverage and a more freewheeling editorial style — find themselves in a competitive environment. A new breed of alternative/entertainment weeklies has entered the market in larger cities to take chunks of advertising dollars. The Internet and free-online listings like Craigslist are targeting classified ads. And in some cities, easy-to-read free commuter dailies are vying for the same youthful audience. Those challenges have created something of a two-tier world for the weeklies. Papers in smaller cities, where the competitors are still relatively few, are still seeing growing readership and profits. But publications in larger cities with more competitive media landscapes are facing some of the problems besetting their mainstream print counterparts. One clear sign of the changing business climate in the alternative weekly world was the controversial merger last year of the two largest weekly publishers, New Times Media and Village Voice Media. The joining of the two giants was the first real mega-merger in an industry that had frequently been critical of the big ownership conglomerates in the mainstream media universe. In this, the eighth in PEJ’s series of nine roundtables with industry experts on the future of the news media , our panel of alternative newsweekly professionals see different futures for their outlets in the Internet age. Some believe the weeklies need to broaden their demographic and community appeal to flourish, while others think they are somewhat insulated from print’s online-related woes. There is also speculation that the era of pay-for-content may be coming to an end and that the alternative weekly model of free distribution will become the standard not just on the web, but in the wider print world. Alison True, Editor, Chicago Reader. 1. If there was one thing you could change about the Alternative Weekly industry what would it be? Alison True, Editor, Chicago Reader: We’d have more money to spend on reporters. Anyone can blog for free, but the kind of digging that allows us to dog the government takes funding. Matt Gibson, Publisher, The Missoula Independent: I wish that more publishers and editors formulated the core values of their newspaper around ambitious, high-quality journalism—rather than ideology and politics. “Alternative” need not be synonymous with “progressive,” nor is “liberal” a prerequisite for “worthwhile.” When we define our newspapers in oppositional terms, it boxes us into a corner that limits our options and our appeal. The word “alternative” doesn’t help much in that respect. These problems aren’t nearly as severe as they once seemed, but the stereotype still burdens the industry. Richard Karpel, Executive Director, Association of Alternative Newsweeklies: There would be less animosity between papers in competitive markets (I can dream, can’t I?) and between alt-weeklies that have different approaches to journalism . Julia Goldberg, Editor, Santa Fe Reporter: I think we need to continue efforts to create greater diversity in our business—Mike Lenehan from the Chicago Reader has already done a lot on this front in his capacity as Diversity Chairman and with the Academy for Alternative Journalism. … I also think altweeklies must continue and increase their work on open-government issues and expand participation with groups like the Electronic Frontier Foundation, which is on the vanguard for watchdogging the Internet for free-speech and civil rights issues. Finally, I increasingly think that rather than cogitatively masturbating all the time about how to “get” younger readers, we should, as an industry, spend more time promoting youth literacy. … If we’re in this for the long haul, then ensuring the ensuing generations like to read and understand the value of journalism will go just as far in assuring our collective longevity as figuring out the best way to copycat myspace.com and the like. 2. What do you think are the short-term and long-term impacts of the Village Voice-New Times Merger? Karpel: I’ll let others take a stab at this one. Gibson: In general, alt-weeklies across the country are becoming more professional, but less distinctive. The New Times-VVM merger will reinforce that trend as the VVM newspapers lose their local identities in favor of a uniform template created by New Times. Long term, the predictable character of the New Times papers will encourage rivals to compete in those markets with more distinctive content that forges a deeper personal connection with readers. Six or seven years from now we might be noting the irony that New Times’ push to consolidate control of the free weekly business nationwide led directly to increased competition and a proliferation of alternative voices in their markets. True: Obviously in the short term the individual papers are going to undergo personnel and content changes related to the preferences of the new owners. And if New Times reuses some content in multiple papers, I don’t think that means the end of those papers’ individuality. One of the main values of these papers is their localness, and I doubt New Times has any interest in using a cookie cutter to the point that the papers become indistinguishable from one another. They know the value of local reporting. As far as business goes, I’m sure the altweeklies that are now in markets with VVM papers have concerns about fair practices via advertising pricing etc. If I had to make a prediction, I’d say the two most interesting markets to watch will be Seattle and San Francisco, where New Times papers are now in competition with altweeklies that have very strong brands and identities (The Stranger and The Bay Guardian). … And it will be interesting to see the way the Ruxton/AWN situation gets sorted out. 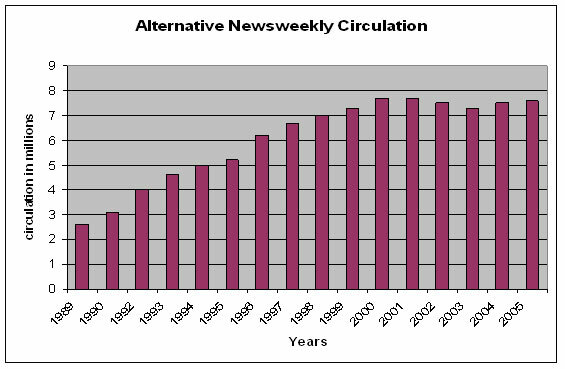 (Ruxton, which is owned by VVM, and AWN, the Alternative Weekly Network, are the two national ad sales companies for the alternative weeklies). Aside from the business fallout, there’s the journalism melee. Some believe that New Times produces a less activist, less political, more cookie-cutter brand of journalism than Village Voice did and it is changing the liberal zeitgeist in which this industry was born. And the fear, subsequently, is that what New Times is doing is a threat to alternative journalism itself. I guess this is the argument I don’t really buy wholeheartedly. First, I’m not sure why it has to be an either/or proposition. Second, while I haven’t surveyed the entire New Times field, I certainly know several of their papers—Westword in particular—that are really, really good and distinct. … To me, New Times’ success has some potentially optimistic components. Here we are in an age where allegedly no one wants to read anything longer than 36 words and this company is succeeding with 6,000-word stories, many of which I have found to be great journalism. 3. As we noted in this year’s report, there do appear to be some changes going on demographically in the weeklies’ readership – readers are older, but also more often parents. What kinds of impacts could this have on the weeklies considering that advertisers are primarily targeting young singles? Karpel: First, I’m not sure that I agree that the minor changes you noted are real. There are huge problems with the Media Audit data that you’re using – not your fault; Media Audit is all we’ve got — but I would first need to see several years of the same trends to be convinced that they mean anything. This isn’t to say that our readers haven’t gotten older — they’re are simply more people over the age of 40 than there used to be, and younger people clearly do more of their reading online than their elders. But I don’t think that that much has changed in one year, and I’m very suspicious of the “more parents” data. Given the other swings we’ve seen in the Media Audit numbers, I wouldn’t be surprised to see it move back in the other direction next year. 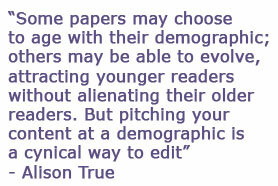 True: If that’s true some papers may choose to age with their demographic; others may be able to evolve, attracting younger readers without alienating their older readers. But pitching your content at a demographic is a cynical way to edit. Despite accusations by some (if the occasional letter is any guide) that we’re running this or that feature in an attempt to recruit younger readers, in fact plenty of young writers with young attitude wantto be in the Reader and they coexist perfectly with less youthful contributors. No one ever expects every feature to appeal to every reader. I always assume variety and unexpected juxtapositions are desirable. Goldberg: Clearly we should work exhaustively to recruit younger readers by cutting all our stories down to no more than two paragraphs and making sure those stories report only on video games and iPods. I’m being facetious, but maybe not entirely. Most of the ways I’ve seen papers try to do this—whether they are daily papers or faux alt.weeklies —is condescending and offensively cynical. But clearly weeklies, like all media, need to keep figuring out ways to draw in younger and new readers, a demographic as elusive as the undecided voters of 2004. True: If that’s true I don’t see why twentysomethings working for minimum wage are a better target than aging professionals who’ve got more money. Goldberg: Do advertisers primarily target young singles? I don’t know if this is true but, if it is, then perhaps advertising salespeople need to try to change that trend (spoken like someone in editorial, right?). Most of the young singles I know spend less money than the 30-40something parents I know. But they all spend money. I think if editors are working hard to keep in touch with their readers they can figure out ways to write about subjects that cross “check this box” demographics. But I also think allowing demographics and economic concerns to dictate content don’t tend to produce very interesting content. But I’m a thirty-something romantic (and a consumer). 4. There is something of a two-tier market now in the world of the weeklies. Big market papers seem to be peaking in ads and readership, but small market publications are still growing at a strong clip. Could some weeklies become“mature” and see hard times like many metro dailies? True: Of course they could, but hard-times isn’t the same as end times. The question assumes the publication is a static entity instead of one can evolve. Goldberg: Any newspaper trend that shows flat growth or declining readership should be cause for concern to anyone in this business. We can’t take our readers for granted and we can’t assume we’re immune from any trend. In a small-market it’s easier to hit a lot of notes and to keep re-evaluating your community and your paper. You’re not trying to be all things to all people, you never have to fill your pages with wire stories, you can keep trying new things and seeing what sticks and what doesn’t. Karpel: I think some major-market alt-weeklies have already matured. And I think all alt-weekly publishers should be concerned about the challenge of dealing with the Internet. At some point in the not-too-distant future, these trends are going to catch up to the small-market papers as well. Gibson: I suspect that the current momentum of the smaller market papers might be attributable to their broader reach. When the total advertising base is limited by market size, alt-weekly publishers must capture a larger market share just to make a go of it. In our case, we can’t survive with just part of the audience. We need to get a piece of every household. Large market alt-weeklies that target a particular niche will naturally get stuck by the limits that niche. Once they’ve maximized the potential of a particular demographic segment, growth will become more difficult to achieve. To increase market share, they must strive to either render all other media less relevant to their demographic, or expand into new demographics. 5. How much confidence do you have that traditional mainstream media organizations will survive and thrive in the transition to the Internet? I think mainstream magazines probably can expect to survive in print a little longer than traditional newspapers, but I also think they are not positioned well to make the transition to the Internet — aside form the newsweeklies, they’re moving way too slowly and without any sense of urgency — and at some point that’s going to mean lots of magazines are going to go out of business. True: It’s clearer than ever people want to hang out with like-minded peers online—for free. But there’s no reason MSM sites can’t be gathering places too, providing peer groups or mp3s or videos or whatever… . [S]urrounding your journalism with cheap pleasures is nothing new. On paper it’s been entertainment calendars and dirty ads and apartment listings. We just need to continue to present our journalism in an environment that offers delights other than the fine reporting. Like always. As much as they like blogs, I don’t think people have completely rejected the idea of the news organization as filter, or have lost respect for the value of fact-checking and investigative reporting—and the only reporters who can afford to do good and accurate work are those who are paid to. Goldberg: To me, the perceived threat of Internet hegemony is interesting but, ultimately … there’s more to be learned and thought about. In other words, the Internet is a platform, it’s a technology, just as the printing press was a technology. There still need to be creative people with vision behind it. And mainstream media needs to think about how the Internet can help it with its mission, not shift its mission or franticly create fear-driven derivative models of what’s already out there. Do you think the economic model of the Internet has to shift from an advertising based model to something else for traditional journalism to survive at a level that we have become accustomed to? If so, do you have any thoughts on what that new model might be? Gibson: I believe that mass media in all forms will continue to generate the bulk of its revenue by carrying messages for people who want to sell something to the audience. The unique capabilities of the Internet will not change that fundamental practical reality. In fact, I believe that audiences will be less and less willing to pay for content, virtually guarantying that the only surviving mass media will enjoy strong support from advertisers, because those that do not will disappear. True: I’m sure the advertisers will catch on soon. Goldberg: I think mainstream media need to consider new ways to use the Internet to economic advantage. Creating online parallel advertising-based models doesn’t seem to have been hugely successful … . To me, the best way to use the Internet to make money (not my area of expertise, obviously) will be to target advertisers for whom the Internet can be used in a different way than print media to engage readers—to create (as has already been done) value-added content, such as more downloads, films, better databases and the like. I don’t know precisely what the next technological advents for the Internet will be, but anyone looking to profit from the Internet should be thinking emergently. Karpel: Actually, I think daily papers that charge a newsstand fee are going to be forced to survive on an advertising-based model. I expect to see the first dailies begin going to free distribution within the next five years. I don’t think newspapers are going to be able to find a silver bullet that will allow them to survive online. And I doubt that there is going to a single “model” that’s going to dominate the business. Newspapers are going to have to find dozens of different ways to monetize their Internet operations, and I suspect that each organization that survives will find a different way to do it.